A home here in Prescott has 3 distinct wings. The main area is all African and African-inspired decor. The other 2 areas are Irish and Italian. Those will be muraled later. Once again, I learned a lot in researching African Folk Art. The different symbols are not just doodles. They have meaning. I learned the technique for doing African mudcloth. It is a long, drawn out process, but the cloths made are beautiful! Anyway, here are some of the pieces, so far. There’s lots more work to be done in this home so I will add to this blog as I go along. This fireplace is a work in progress. Something will happen to the bottom brown and white strip. 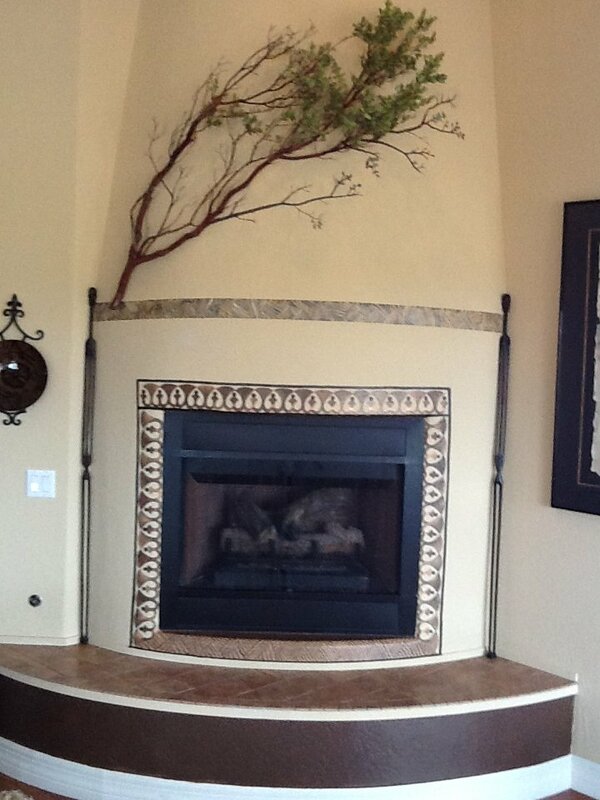 The manzanita above the fireplace is part real/part mural. (I just loving playing tricks of the eye!). It was needed to do so that no matter where you sit in the room, the sight was appealing…not so much balanced, but just nice. 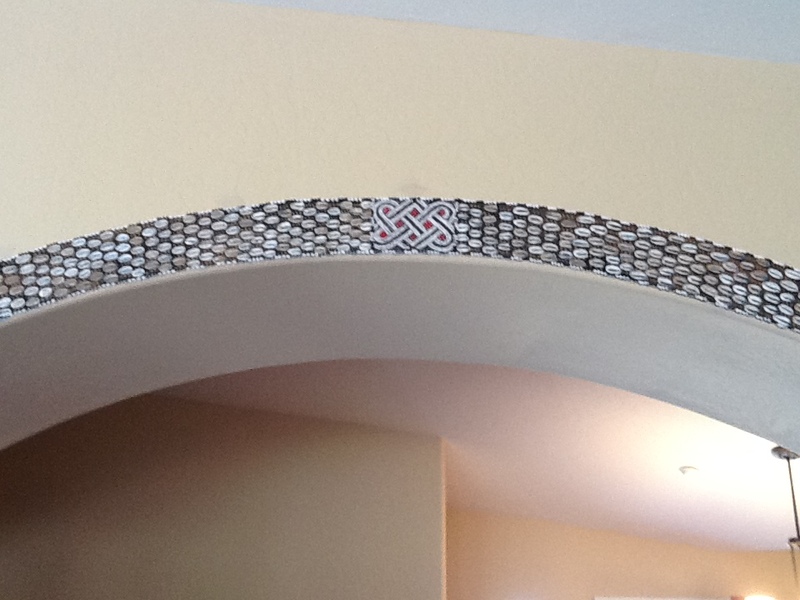 Below is an archway design inspired by a belt thing the client had. The little shells on the belt are used as currency in many areas of Africa. Also included is a smaller image of the detail work of the “beads”. 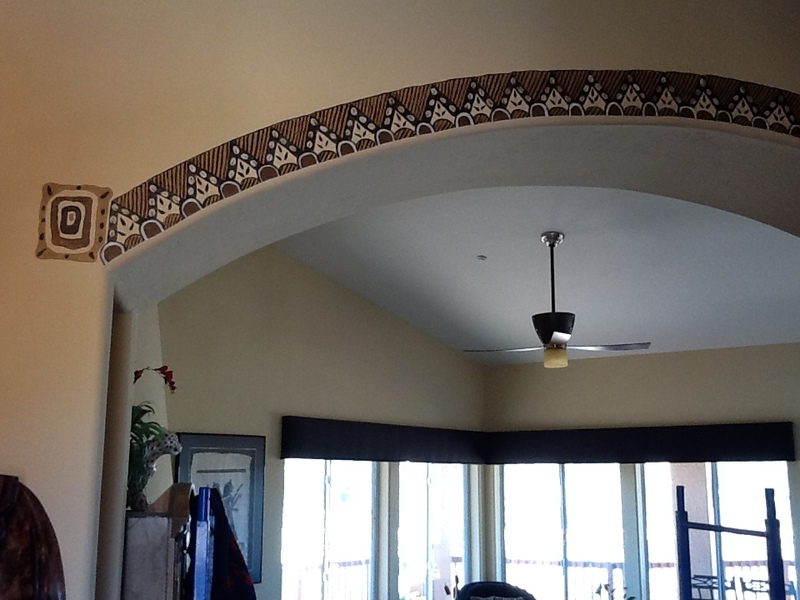 and lastly for now, the other side of the above arch with another design and the doodlie things I made up that just seemed to look good on the endcaps. Coming soon will be some mudcloth inspired pieces and other designs. I like doing this person’s house not only because they are totally cool people, but also because I can do a little here, a little there, and some even at my studio. These pieces are good to fit in between some of the larger murals, family things and recent traveling I’ve been doing. They are refreshing breaks!